When writing a book, sometimes the trick is staying the course even if you’re not sure where you’re going. I flew home to Singapore a week ago after 15 days of book research in Saigon. It was an intense and challenging trip. I arrived in Vietnam with only a loose plan for what I wanted to write. I left with a big bundle of new stories, a narrowed-down concept I’m excited to begin molding into something publishable. I’ve always been intrigued by the cultures that co-exist in Saigon’s backpacker area. Tourists hang out and party along the main roads, yet in the tangle of alleys between Bui Vien and Pham Ngu Lao Streets, a residential neighborhood still thrives. Then, there’s a third culture – people from elsewhere in Vietnam, drawn to Saigon hoping to eke out a living selling sundries to the gaggle of foreign visitors. Mai moved to Saigon 10 years ago from a town near Hanoi. 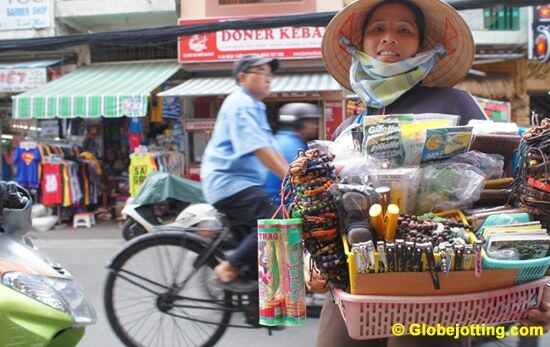 The mother of two children, she sells bracelets, toys, and other sundries on the streets. On a good day, she says, she earns five to ten US dollars. On a bad day, she has no business. I wanted to write about this neighborhood because I’ve got crazy personal stories that have happened to me there. I wanted to mesh my stories with those of other people from all of the three aforementioned cultures. That was my loose plan. 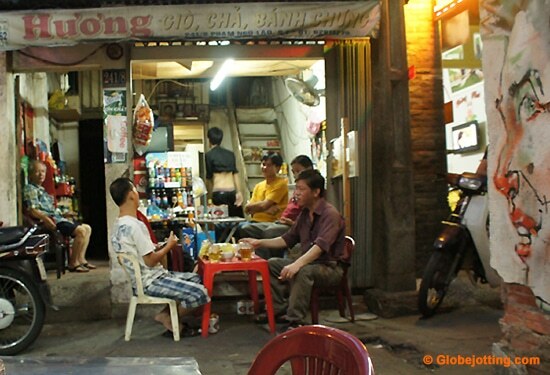 Escape the tourist carnival of Bui Vien Street, wander through the labyrinthine alleyways and you’ll discover neighborhood shops like this one, with two tables and a cooler full of beverages. Despite loud voices of insecurity in my head, I did not divert from my plan, and I’m glad for that. It took me a few days to get traction. Once I did, new stories started gushing at a dizzying pace. A little help from my friends: Phúc and Tuấn are my drinking buddies and interpreters. Day ten of my trip was a turning point. With my pals, Phúc and Tuấn, I wandered the residential back alleys. We met Hoa, a 61-year-old former policewoman who had been a soldier for the South Vietnamese Army. Today, Hoa runs a guesthouse. She filled me in on topics other people were reluctant to discuss – things like street children and involuntary prostitution – sad things you can’t ignore in a book about a neighborhood that feels festive to most visitors. My friends and I had beers at a living-room drink shop. A family has run the shop in their home for 58 years. As we talked, Hai, the husband, never relinquished his gentle smile, yet he told me he felt sad. In ten days, his family would move out of this home, where he had lived since birth. Complicated, extended-family finances are forcing them elsewhere. 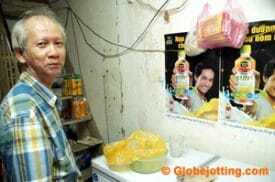 Before it was a drink shop, Hai’s one-room business in his home was a karaoke bar for neighborhood residents. In a different alleyway, we met Ngoc, who sells drinks, snacks, eggs, bananas, and cigarettes – again out of the ground floor of her home. The same age as Hai, she talked of her neighborhood burning down during the 1968 Tet Offensive, yet spoke more passionately about the tight-knit community she feels there today. On other days, I interviewed newspaper vendors, souvenir sellers, street masseurs, and shoe shiners. I heard the life stories of street touts, who many tourists consider a nuisance and try to avoid. People told me about personal encounters with ghosts, and speculated about whether or not one local bar is haunted. I became good friends with Bao, a night-receptionist at my hotel. Born into a Viet Cong family, Bao grew up in the Demilitarized Zone. As a child, he foraged for unexploded land mines, selling the scrap metal to earn money for his family. On several nights, in the hotel lobby, Bao shared his experiences well past 3 a.m. He told me he hoped he could bring me to visit his hometown someday. On my last night, it dawned on me: My new friend is 35. I’m 44. In a different decade, our governments might have ordered us to shoot each other. 18-year-old Vu shines shoes in Saigon’s backpacker district. He charges the equivalent of 50 to 70 US cents per shoeshine and averages around ten customers per day. Three weeks later, I now have a better-defined sense of the path my book will follow. There are still missing pieces. I’ll be returning soon to search for them. In the meantime, home in Singapore, I’m excited to start weaving these tales – figuring out how the puzzle pieces do fit together rather than worrying that they don’t. I discovered something powerful on this trip about the creative process, and about maximizing our chances for follow-through and success in a big project. I’ll share that discovery in a blog post next week.